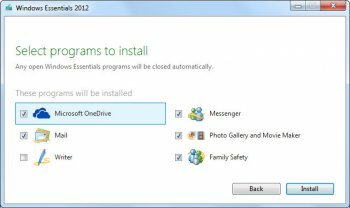 Windows Live Essentials includes free programs from Microsoft for photos, instant messaging, e-mail, blogging, family safety, and more. Get them all in one download and get more done with Windows. Photo Gallery and Writer are two of my favorite apps. Too bad that Messenger is gone. I've used Live messenger & MSN before that since day one & have never had any security issues whatsoever - Live is the best stand alone instant messenger client around by far. If you have malware problems look elsewhere than live, unless of course you are stupid enough to click on any URL you get sent but that applies throughout the internet, some however get infected because of pure stupidity on a regular basis. v.16.4.3503 is designed to work with Win7 and Win8 only. Live Writer is good, perhaps one of the best offline blogging tools there is. Messenger... meh... it's ok but it just seems to get bigger, more ads, more poxy animated icons that people send me in messages and nothing of any real value. The main reason I don't use these tools and will never again use these tools, is the security issue. They're not insecure in and of themselves as far as I'm aware. Just having them on your system though makes you an easy target - the amount of people I know who have managed to pick up some malware that exploits their hotmail, their messenger contacts and blogs is just crazy. My wife dowloaded this yesterday since it was listed as a critical update or something to that effect. She did call me and check and It did sound to me like something that would need updating to fix a security glitch so I gave the O.K. I don't apreciate M/S pushing unessential software on unsuspecting users especially when it doesn't work. Three attempts to install the S/W including ONLY installing the mail feature and it would not sent or recieve mail. I uninstalled it and went back to the Windows Live Mail version from August 2009 and everyting is working again. I was wondering why Windows Update stuck this in the important updates list -- good thing I looked it up. I'm not going to even bother installing this just because I have everything I need already installed on my computer. I don't install anything without doing lengthy research on it and I would recommend people start questioning 'official' Microsoft ANYTHING as well. And for those bashing the most popular operating system, XP, at least most of the bugs have been worked out of it as opposed to the pretty unstable and incompatible Windows 7 where older joysticks (which only have older drivers available) won't even work properly or not at all. I don't use XP anymore but that is because Vista came pre-loaded on my new computer. I don't have any preference myself considering I am quick to familiarize myself with the features and inner workings of any operating system I use and actually enjoyed having to spend 2 months stabilizing my OS after I bought my computer. But others would rather have reliability and not be bombarded with candy coated, re-packaged stuff that are just older programs made to be more annoying and free of any privacy. For those who don't care about that, then go ahead and install it. Again, Microsoft is forgetting that Windows XP SP3 is supposed to be supported to 2014. New versions are dropping XP before then!! Not everyone using XP is a living under a rock. Many people have company PCs that have XP on them, and are stuck with XP until the company decides to upgrade the PC. (Yeah, the PC not the OS). I never chose XP, I was issued it. As for this verison of MWLE, it is as bloated as ever, but my employer uses it so I have to as well. The install window is corrupted and cannot install anything. D/L several times from different places with the same result. the new windows live mail is nice, but the messenger is very bad. the webcam works very bad, you don't know anymore the number of contacts you have, now it's synchronized with your MSN profile, you can't chose anymore the name you want, when you put the messenger in full mode, it's totally useless as the only option you have is to see what you wrote as status or what your contacts wrote. and the other option is to see the MSN.com infos. who had the idea to modify the messenger that way ? now you can associate facebook with messenger, ok but i don't care, if i want to write something on facebook, i prefere logon to facebook.com and use the facebook website. there are now aero graphic effects, that's why it's not compatible anymore with xp. I hope they're going to correct this new version of messenger very fast cause for now i stay on version 2009, i don't want this version 2011, they forgot that messenger first use is to communicate in live with your msn contacts and that's the reason we use it, they didn't create any improvment on that. Excellent software package- only use messenger, mail and photo gallery. No XP support? Booohooo! Why can't that operating system just die already!